Aromatic vegetable soaps, available in three delightful colours and fragrances. Individually packed in sheer organza gift bag with custom printed gift tag. Contains 40g guest sized soap bar. Fragrances/Colours: pink (rose), lavender (purple), frangipani (cream). 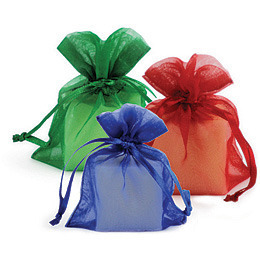 Organza Bag Colours: gold, silver, white, pale pink, pale blue, lilac, violet, lime, avocado, red, black, hunter green, burgundy, royal blue.